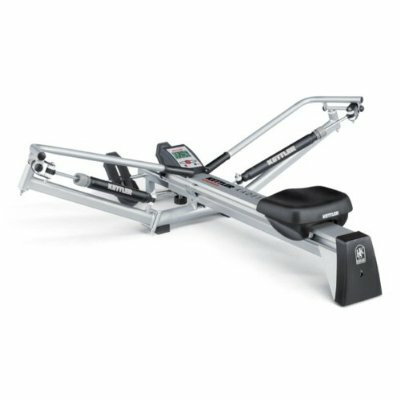 The Kettler Kadett Outrigger rower is quite different from most rowing machines with it's realistic action. We find people either love it or hate it (perhaps hate is a bit strong) but if you're not too keen on the action you won't use it. 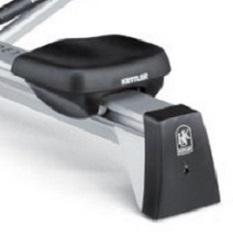 The Kadett is a hydraulic rower that uses pistons on the 'oars' to resist your movement and work your muscles. The resistance level is alter by turning a collar on the piston and we found the range of 12 different levels to be sufficient for most users. However, some may find adjusting the collars on both pistons awkward. It also means having to stop and change settings if you're doing pyramid training. The Kadett is a compact machine and easily folds up into a smaller size for storage - see dimensions below. If you're short of space at home this would make a suitable choice. 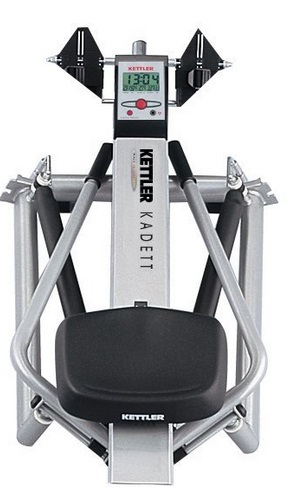 Kettler are a German company and generally make good quality fitness equipment. We found the build quality to be very good and this looks like a machine that will give you a few years of trouble-free use. We've heard of a user who had a problem with one of the pistons - however, these are covered for three years under the warranty and are easy enough to replace. You can read out the drawbacks of pistons here. The seat is quite comfortable, not as good as the Waterrower's, but this model is half the cost! The sliding action was also quite smooth and quiet, much quieter than air resistance machines - an important consideration if you have an apartment. However, one things that lets down the Kadett is the foot rests. A number of users complained that they move when rowing - not good. The connection to the frame is too weak and we've had emails from users who say they've broken and needed replacing. This is unfortunate as otherwise it's a pretty good rower for the price. Another deal-breaker for some may be the use of pistons. Many dislike them on rowers because they can never be as smooth as an air, magnetic or water mechanism - see more here. But on the positive side, hydraulic pistons are a cheap component and bring a rowing machine into the budgets of many who may otherwise not be able to buy one. Of course, they do start to leak after a year of heavy use, but they're easy enough to replace. 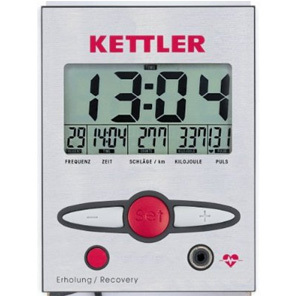 It has a good sized LCD display and is easy to read the main exercise data such as distance, time , number of oar strokes, speed, calories, and heart rate. With a few presses you can set yourself a target of either distance, time or stroke speed and it will beep when you've achieved it. Our model came with an ear-clip for the pulse monitor that's displays on the console - although we've heard this isn't always standard (check with the retailer before you buy.) Some will find the wire and clip uncomfortable so you may need to buy a separate wrist or chest strap monitor. Being able to monitor your pulse is a big advantage. This gives you the opportunity to add heart rate training programs to your workouts. These are a great way to get the most from your sessions and can aid weight loss and accelerate fitness levels. For more on this sort of training, please click here. 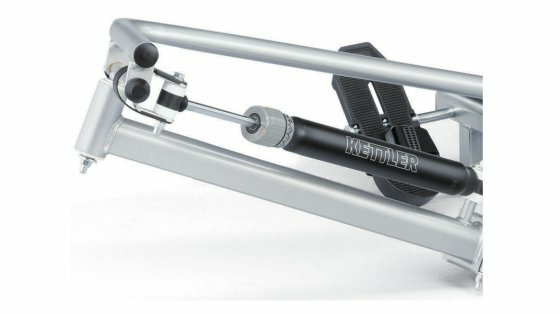 The Kettler Kadett Outrigger is a clever piece of kit. It closely replicates the rowing action of being on the water - but is this necessarily the best way to get fit? You'll either love the action or hate it, We recommend you try this one first before you buy. If you like the action then it's a good, compact machine that will fit easily into your home. If you don't like the action it will be a waste of your money because you won't use it. But if you're a regular rower in a 'proper' boat it will be fine. The build quality - what you'd expect from Kettler. Feels solid for a compact machine. Ability to adjust settings to suit your height. Folds up to a small size for easy storage. Some of us didn't like the rowing action. Some may find changing the resistance levels awkward. Took us well over an hour to put it together when it arrived - but it's only once. Foot rests are not comfortable and move when rowing. 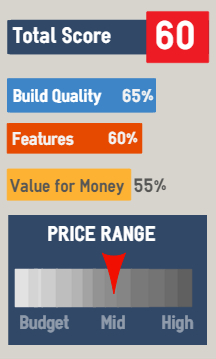 Price seems a little high for what you get. 49" x 31" x 12"
For just a few extra bucks you can get the Velocity CHR - a slightly better model in our view. The Concept 2 Model D a few hundred dollars more but it's money well spent, or consider a water resistant model such as the Neptune or H2O ProRower.